Here are the results from the recent “Asia-Pacific Edition” of the General Staff Meeting. The recording for the public portion is available here. Congratulations to both hvt2011 and unjinz for passing their 3-month probation period and becoming full moderators! A new general rule has been added: “Do not plagiarize builds that you do not have permissions for.” Copying builds without permissions is disrespectful to the original creator and will be subject to warnings. Builds that you do have permission for are okay. Gliderports are officially allowed on the server. We will not specify any concrete sizes or specifications for gliderports, but they should generally not be any larger than a helipad. Please do not abuse this privilege and create gliderports that take up too much space. Members are asked to not put any banned items into schematics they upload. Staff can check schematics before they are pasted, and may refuse to do so if the purpose of the schematic is not clear. Similarly, members are asked to not bring banned items into the server using saved toolbars. It is technically not possible for us to prevent this from occurring using plugins. The import of banners and heads using saved hotbars is allowed. Staff are reminded that when they issue warnings to players, they must ensure that the player confirms that they have received the warning, and that they understand the reasons why they received the warning. They must also make it clear if they are receiving a verbal warning or an actual warning. Staff will be formalizing a process to choose featured pages on the wiki amongst themselves. We will be using a shared Google Doc to ensure that the choices of articles are appropriate for this category. From the Eastern Line extension, we received a few complaints about how the stations were distributed, specifically the fact that only people who were online at the end of the October GSM were able to claim stations. Since this is unfair to players who were unable to be on the server during that time, we will be ensuring a more fair process of distributing stations for future extensions. Some members have called for changing the #staff-emergency channel in Discord into a more general channel for all staff requests. After some discussion, staff have decided this solution would cause more problems overall, and instead we will be defining the criteria of what is allowed in the #staff-emergency channel more concretely. A Holiday Town Decoration Competition will be organized by godzilltrain. Construction for the competition will be open from Saturday, November 25 to Sunday, December 17, with public voting taking place from Monday, December 18 to Sunday, December 31. The full rules can be viewed here. A Central City Holiday Market will be organized by AP_Red. More details will be available later. Christmas Island and a holiday-themed Central City Park will be prepared soon by MinecraftYoshi26 and _Kastle. For those that are unaware, Christmas Island is a tradition on the server where players can build in-game gifts and notes of appreciation for other players. The Amazing Race 8 organized by MinecraftYoshi26 will be happening over the holiday break. Details including actual dates and times will be provided later. Promotions for the next City Rank Candidate Batch (#20) will be announced on December 25th. If you have any proposals for events during this holiday season, please send them to the staff e-mail address. All of the following extensions have been approved, and construction will be performed by the associated moderator. Please note that the founding of any new towns along any extension route is prohibited until the extension is complete and the station has been assigned to a player. To be constructed by godzilltrain. Continues north from Nippia via Pilmont and Chalxior, then turns west through the wilderness to the end of the landmass. A Google Form for signing up for stations will be provided later. To be constructed by AP_Red. Continues south from D23/C65 past Whiteley, then turns west through the mesa biome crossing underwater until it meets up with the Mesa Line at M34. Please note that there are several inactive towns along this route. When you sign up to claim a station, you are also claiming ownership of the inactive town. Sign up to claim a station using this form. Please note that sufficient reasoning (50 – 100 words) will be required to claim a station. Stations will be assigned at the next GSM. To be constructed by Just_robinho. Continues south from Marblegate to the inactive town of Lutetia at F30, then turns eastward through the forested valley. Sign up to claim a station using this form. Stations will be assigned at a later date. Staff will be adding A-Roads as an layer on the dynmap in the coming months. A Central City Rail Hub will finally begin construction soon, headed by _Kastle. This hub will initially house third-party warp trains, with minecart-based systems to be considered at a later date, possibly at a separate facility. The hub will be located in a plot north of Central City, just south of Grayzen. Common use tunnels will be constructed in several directions from the hub from which third-party companies will connect to. A proposal from _HeavenAngel_ to build the B93 from Woodsdale to South Quiris via Heights City has been approved. A proposal from time2makemymove to extend the A5 further south has been partially approved. The road can be extended straight south until it is next to Delta City at ZS12. From that point forward, a separate proposal from time2makemymove, autobus22, or both will need to be sent for the rest of the A5. A proposal from AyyLion to build the B54 from Segville to Delta City has been denied. The previous A5 extension proposal will provide a sufficient connection. A request from SoSo123 to own the town of Fenton has been denied. The original owner of the town has recently become active. A request from Purrcat2010 to own the town of Wolf Peak has been approved. A request from _Kastle to own CitiRail has been approved on the condition that hnt, the caretaker of _frozen’s assets, approves. A request from CyAmethyst to own the franchise Pancake Place has been approved. A request from AlfiePops to own the town of Mason City (C12) has been denied. Any new players like Alfie must construct their own town first and rank it up before asking for ownership of an existing town. The Central City Retail Building Competition has concluded. A set of results was provided by Frosty_Creeper10 just before the GSM, but due to a misunderstanding, Frosty and the judges frogggggg, London150, and ModernArt were included as participants in the contest. I do not think allowing the organizers or judges of the contest to participate is fair, so I have asked Frosty to provide a revised final list of winners. Please note that for any future proposals for contests, we will require that the organizers and judges refrain from participating. The final results can be viewed here. All in-game prize monies have been paid out to all the winners. Congratulations and thanks to all who participated! The October 2017 General Staff Meeting has concluded. The public portion recording can be listened to here. After seeing some serious disagreements and drama from the United Cities spill over on to the server, I have instructed the UC officials to take immediate steps in enforcing a level of respect and decorum amongst the UC members, or risk being suspended or abolished altogether. I do not want the MRT staff do have an active role in monitoring and enforcing the UC, as I do not want to add more burden to them, and that it would not be fair to the staff who are not part of the UC. I am giving the UC a chance to self-regulate and self-enforce their own rules, and I am strongly urging members of the UC to take steps in learning how to debate others more effectively without resorting to personal attacks or emotional escalation. I am quite disappointed in the conduct of some MRT members who, in my opinion, have used the UC as a place to circumvent the MRT rules and a basic code of conduct. With these tips, I hope that everyone will come to a better understanding of each other and that this will lessen the frequency of disagreements spiraling out of control. One of our members, VernCow, has reported that he has been receiving threatening emails. While we are unable to trace who sent the emails or where they come from at this time, we would like to state that we do not tolerate this form of cyber-bullying even if it is off the server, and that if it continues, Vern or the staff will consider contacting the authorities. Effective immediately, in addition to inheriting ownership of a town if the Mayor is permanently banned, a Deputy Mayor will also gain ownership if the Mayor has been inactive for at least 3 months. This policy has been unofficially enacted by staff for a while now, but it is now formalized in the rules. The exception to this rule is for players at the [Premier] rank. Premiers who become inactive for more than 3 months will NOT have their city automatically transferred to their Deputy Mayor. This exemption is in place since Premier cities are more-or-less considered to be “finished” cities, and should not be further developed on. The Deputy Mayor in this case will be considered a “caretaker” who can make minor changes to keep the city working and connected, but they will not be allowed to overhaul or expand the city. Please note that this exemption does not apply to Premier who are banned from the server. Effective immediately, any player who gives their assets (including towns, cities, buildings, companies, etc.) must notify staff by email. The player receiving these assets should NOT be the one notifying staff, since the staff cannot confirm the transaction from the receiver alone. Bus terminals that serve only a single bus company will be subject to additional scrutiny and are less likely to be approved. Bus terminals that are shared by several bus companies will be more likely to be approved. If you have any questions about these bus construction rules in Central City, don’t hesitate to contact your nearest friendly staff member. Rail line owners do not own the land surrounding their lines. Players who wish to build or expand their towns around an existing line are allowed to do so. Rail line owners are not obligated to adjust their lines or add stations to their lines for any new towns that are built after the line was constructed. 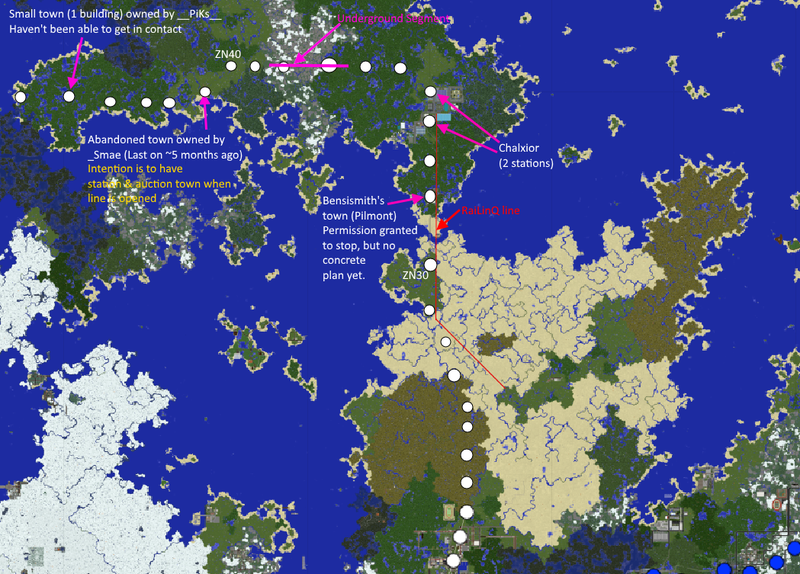 The new MRT line along the far eastern edge of the server will be officially named the Jungle Line, since it crosses through the only naturally-occurring jungle biome on the new world. Since we are out of wool block colours, stations on this line will be constructed out of jungle wood blocks. There are currently no plans to construct this line, but as soon as a staff member volunteers and the plans are available, we will let you know. 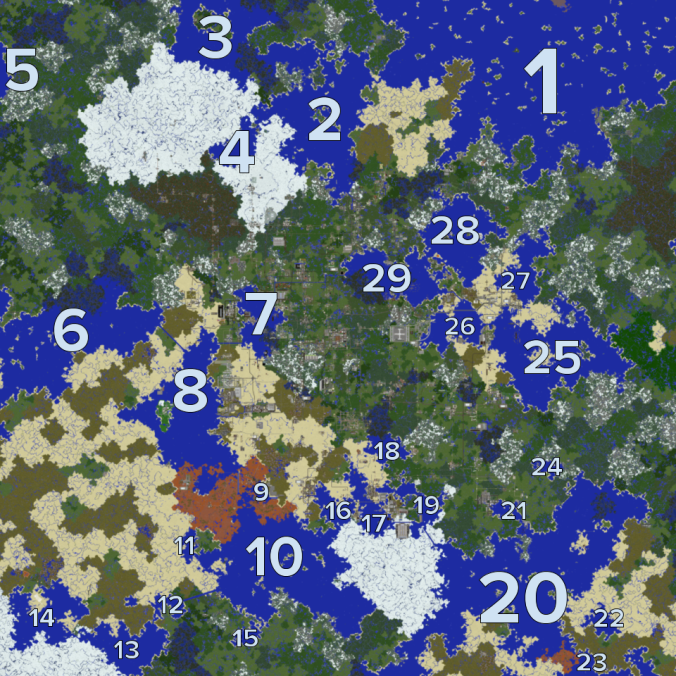 We are looking for proposals from members to officially name the various major lakes, bays, oceans, and water bodies on the server. E-mail your proposals to the staff [at] minecartrapidtransit.net. Proposals can range from all water bodies, or just water bodies that are in a certain region or vicinity of the server. Water body names next to existing cities or towns will be given priority. All proposals will be considered altogether and an official naming will be hopefully be decided at the next GSM. A proposal from EspiDev to build B753 and B754 in the vicinity of Pixl, Espil, Gato, and Kernogen has been approved. A proposal from time2makemymove to renumber several roads in the southern regions of the new world as well as extend the A5 has been rejected. This proposal needs to be separated and more information needs to be provided: The renumbering proposal requires reasons why, while the A5 extension proposal requires a screenshot map. A proposal from LithiumMirnurX to upgrade his B-Road from Janghwa to Kolpino into an A-Road (A746) has been approved. A proposal from MegaMC to build a road in the southwest connecting Lowami, Columnville, Paralia, and The Tinimine Republic has been approved on the conditions that the road be given an official number, and that care is taken to respect the landscape around the mountainous areas. A proposal from LIthiumMirnuriX to extend the original regions map into the expanded new world has been rejected. Instead, we will be asking thomasfyfe, the original creator of the map, to create a new version. A proposal from BernCow to build an MRT Zoo Community Build at EN17 has been approved. Please contact BernCow if you would like to get involved in this project. A proposal from AlfiePops for a warp center that allows for travel to all MRT stations has been rejected. XW20 – C89 has been awarded to SoaPuffball. Downsview (ZS21) will remain owned by the mayor, Ardyln. time2makemymove will have building rights within the town. Shadowpoint (C6) has been awarded to Mercury203. Congratulations to all new [Senators]! The staff at the GSM did a live review of 3 Premier candidates. The feedback document can be viewed here. Please note that a Premier promotion requires unanimous or near-unanimous approval from the staff present. Frosty_Creeper10 will be organizing a retail building competition, located at a mall near the Central City SW terminus. The competition will be held from Sunday, October 29th at 12 am UTC to Friday, November 10th at 3:59 pm UTC. Judging will take place the next day on November 11th. The judges will be frogggggg, London150, and ModernArt. Please head to that mall or contact Frosty_Creeper10 for more details on how to apply. As a reminder to players, please submit your proposals for any upcoming GSMs at least 48 hours from the meeting time. After the 48 hour cutoff, we will only accept corrections to any existing topics in the GSM, or if you wish counter-bid for a town that is available for auction.